A few weeks ago, I received an email from Tom Shaw. He is an IAI Certified Forensic Artist & Snapshot Account Specialist at Parabon NanoLabs in Reston, Virginia. We started talking about phenotyping and how that could advance the investigations in cold cases. There are cases that grow cold because there is no DNA match in CODIS. 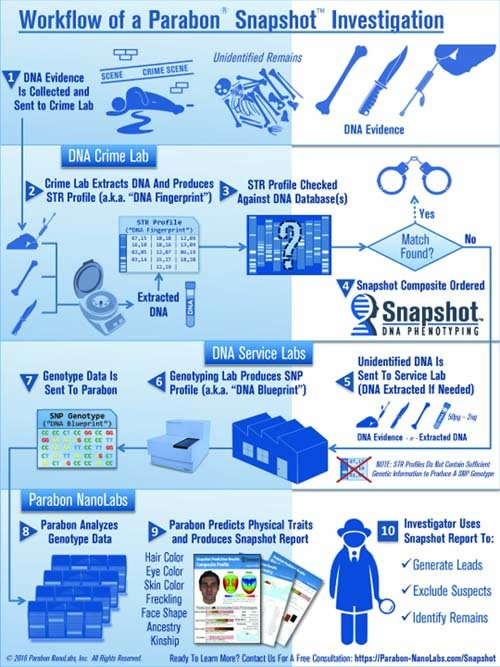 CODIS (COmbined Dna Index System) is the term used to describe the FBI’s support program for criminal justice DNA databases and the software needed to run these databases. After testing the available DNA sample, the lab can tell within a certain percentage of confidence what characteristics they found: hair color, eye color, skin tone, the shape of the face, ancestry, and even the level of face freckling. These confidence statements give police a visual of what the DNA bearer most likely looked like. On top of that, it can help police drop certain people as suspects. All this information helps to rank leads and tips. Even in cases of John and Jane Does (unidentified human remains), phenotyping makes a difference. DNA taken from those remains gives Parabon the possibility to make a “blended composite.” A blended composite is a combination of DNA Phenotyping and traditional facial reconstruction. Together they offer a clearer image of what the victim may have looked like in life. Tom gave me the following case as an example where phenotyping did not just point police in the right direction. It also told the suspect something about himself that he might not have known otherwise. The PDF document about the case is are here. On February 2, 2012 Douglas Troy and Ladonna Mosley French were murdered inside their own North Carolina home. Daughter Whitley (19) was home visiting her parents for the first time since the start of the academic year. Her younger brother Hunter was at a swim meet. During the night, Whitley woke up in her bedroom to a man on top of her. She told police that she screamed for help. Her parents came running and were shot multiple times by the suspect before he fled. Whitley was dating John Alvarez at that time. They married later on. Police found blood inside the French home. It didn’t belong to any of the French family members and not to John Alvarez. The DNA did not match a profile in any DNA database, including CODIS. Traditional forensic DNA analysis could only tell police that the perpetrator was male. After a year of investigation and fearing that the case may grow cold, Rockingham County Sheriff, Sam Page, used funds from the US Department of Justice (DOJ) Asset Forfeiture Program. He wanted to try alternative forms of DNA testing. The first break in the case came when familial DNA testing at the University of North Texas revealed the possibility that the suspect might be related to John Alvarez, Whitley’s boyfriend. The phenotyping analysis or “confidence statement” by Parabon showed that the suspect had a mixed ancestry of 50-50 combination European and Latino ancestry. This mix is possible when people have one European and one Latino parent. John Alvarez has such a mixed ancestry but DNA had ruled him out as a suspect. But here is the surprise: Y-STR analysis showed that the suspect did not share a paternal lineage with John. Nevertheless, the predictions or confidence statement was consistent with John’s brother, José Alvarez Jr.
Police requested a DNA sample from both José Alvarez Jr., and his father José Alvarez Sr. Both men consented. Traditional DNA analysis proved beyond all doubt that the blood found in the French home came from José Alvarez Jr. It also showed that José Alvarez Sr. is not his biological father. That is why the Y-STRs did not match. You can read more about the French Murders here and here. Two other cases where this technology could make a difference are the cases of Jennifer Bastian and Michella Welch. Jennifer’s case used to be linked to the Michella Welch murder. As we know now, Jennifer Bastian and Michella Welch were not murdered by the same person. Based on the DNA evidence sketches were made and show the wanted men in detail. To learn more about phenotyping I encourage you to read this article from Forensic Magazine. It discusses the case of the Bennett Family and should have mentioned the murder of Patricia Smith. As discussed here on my blog, six days before the Bennett Family was murdered (also in their own home), Patricia Smith was killed by the same person. The Colorado Bureau of Investigation tied these two 1984 cases through a DNA match. The match has not yet been tied to a specific person. However, this John Doe will be charged with 18 counts, including three counts of first-degree murder, two counts of sexual assault, first-degree assault and two counts of sexual assault on a child and burglary. Another concern raised are the private companies that do the DNA phenotyping. Their software and methods are usually not published in scientific journals and are thus not open to peer review. Another concern is racial profiling. Determining ancestry is very complicated and as noted, environmental effects can have a great or sometimes even greater impact on people’s features. Despite these issues, phenotyping is advancing cold case investigations. The PDFs and infographic here are used with permission. Kindly note that Parabon is a software solution company. They use partner labs for the DNA phenotyping. Those labs then send the test results to Parabon where they interpret it to make the phenotype (physical trait) predictions.